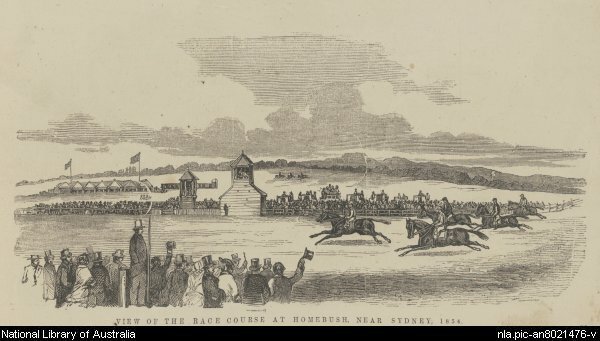 Homebush Racecourse, 1854. Image by Walter G. Mason, courtesy National Library of Australia. Operating between 1841 and 1859, Homebush Racecourse was Sydney’s premier horseracing venue. It was located on the Wentworth Estate in the Homebush area, and stood in the approximate area encompassing the corner of today’s Underwood and Parramatta Roads. When Randwick Racecourse opened in 1859, it superseded Homebush’s track, causing the latter to fall into a period of dereliction, although it still operated as a track until 1880. A man’s body was found on the course in 1860, the grandstand spectacularly burned down in 1869, and throughout the 1870s it was used for human running races. When the Homebush Abattoir was established in 1915, the site of the racecourse was employed as the slaughterhouse saleyards. 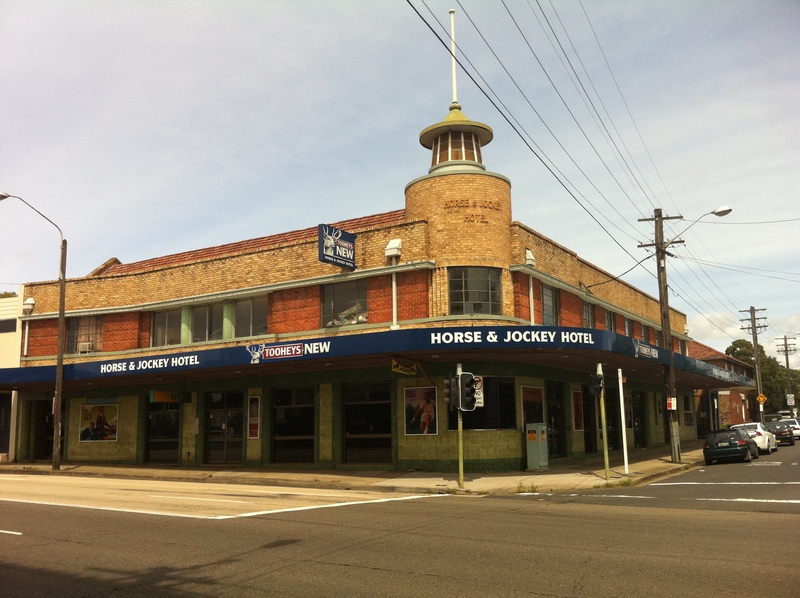 The only evidence that horseracing ever took place in the area is this pub, located along Parramatta Road, east of Underwood Road. The Horse & Jockey Hotel itself has a colourful history – it was originally the Half Way Hotel, named for its location halfway between the city and Parramatta. The site of the death of Australia’s first bushranger, and once patronised by Governor Lachlan Macquarie, the original hotel changed its name for the establishment of the racecourse (which it overlooked), and was the site of the inquest into the 1869 grandstand fire. Rebuilt beside its original site in 1876, the pub itself burned down in the early 1920s. It was rebuilt again in its present form soon after and remains as the only reminder of Homebush’s racing days. Homebush Racecourse was between Saleyards Creek and Boundary Creek on undulating ground sloping up to Parramatta Rd. Although the AJC moved operations to Randwick in 1860, the Homebush course continued holding major races until the 1870’s. A new course was constructed in the mid 1860’s overlapping the old. This new course had Boundary Creek directly down it’s centre. The creek was bridged with an earthern viaduct 200 yards long and 20 wide allowing the horses to race around the rim of the creek valley. The arches of the viaduct were later blocked to form a dam during the abattoir era. The viaduct is now beneath the Golf Driving range. Are you the Dave Patrick trying to contact Mary Gyseman ? if so your email address patrickd56@dodo.com.au is being returned as undeliverable. The Half Way House Hotel was located 200 yards up from Powell’s Creek Bridge just a few metres east of the current Horse and Jockey and was the first licenced pub on Parramatta Road. Built in 1809 of “part brick, part wattle & daub and part wood slab” and whitewashed, a 2nd floor was added in the 1850’s. It was re-named “Horse and Jockey” by Irish ex-convict James Kerwin (aka “Jemmy the Jockey”) in the early 1840’s during the heyday of Homebush Racecourse. Kerwin later moved the “Horse and Jockey” name to another hotel closer to Burwood in the late 1840’s, and the Half Way House was then leased as the “Homebush Inn” by horse trainer “William Cutts”. The “Horse and Jockey” name returned to the Half Way House in the early 1860’s. It stopped trading when a replacement pub was built on the current site in 1883. It remained a private residence until being demolished in the 1890’s. The current hotel is the 2nd re-build on the present site. The local myth of a pub fire was proved false when it was found the demolition and re-build was due to widening of Parramatta Road in 1938. Of interest – John Cutts Dillon (William Cutts’ stepson) lived and trained at the original pub before taking the horse “Archer” to Victoria by steamship and wining the first two Melbourne Cups (1861 & 1862). Do you know anything of a Frances Brown who was granted a Publicans Licence 1832, 1833, 1834 for a “House known by the sign “The Horse & Jockey” at Church Creek, Parramatta? Is this the same place please? Hi Cherie, Church Creek Parramatta could not have been the same place. If you do a google on Archer ridden by John Cutts you will see that John ‘Cutts’ Dillon actually learnt his craft from William Cutts who is referred to as a crack Homebush horse trainer. The Horse & Jockey has been renovated and modernised inside in recent years, with a nice (but small) lounge area and a pleasant outdoor section. Unfortunately, though, the formerly spacious front bar and pool table area has been lost, now divided by a wall with horribe TAB on one side and an even worse pokie lounge on the other. I used to drink here a bit in the ’80s, along with the old Homebush Hotel down the road (now gone). The H&J’s former spacious front bar with multiple pool tables was memorable. I remember it even used to have an ‘L’ shaped pool table with red cloth! Never seen one anywhere else.